P7150039, originally uploaded by Blair Necessities. Well, so far no one knows what the doohickey is in the previous post… too bad because I am rather curious. 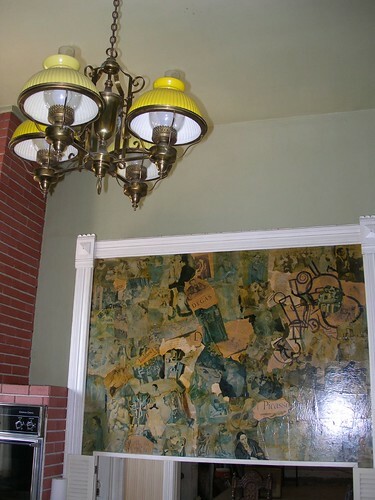 In order to have put this in, they had to dismantle and CUT (yes cut) the mahogany molding and put in a silly BOOK SHELF in the DINING ROOM so that I could gaze upon distorted pictures of naked little boys and lonely looking women. Now, some folks that walk in love it, and while I don’t really hate it I feel it is not a good thing to have in a kitchen. When we get around to taking that thing down, I will give it a place of honor somewhere outside, maybe near where the pump house is when I can talk Chris into getting some laying hens and setting up a coop (though I feel like the coop thing will never happen, it doesn’t hurt to dream does it). I have to admit that the built in is not all bad, because it is also where they installed the dishwasher (and as the laziest house wife in the world, I can’t live without a dishwasher)… but just so you know, the dishwasher is built in to a mahogany cupboard. Also, molding update: there is only the molding around the three windows left to get the living room started in its long road towards it glory… once they are done we get to paint! Which means I will finally have a room that can be usable, the dining room will follow and then I suppose it would be the bedrooms and bathrooms… where the real work has to get done.